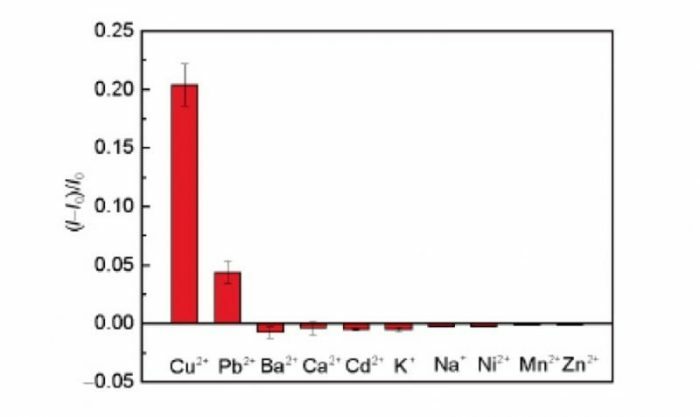 Copper is an essential element in the environment and human body, but at the same time, exposure to high concentrations of Cu2+ ions will potentially lead to acute toxicity and various neurodegenerative diseases. Specifically, the U.S. Environmental Protection Agency (EPA) has set the safe limit of Cu2+ concentration in drinking water to be 1.3 ppm (~20 μM). Therefore, for the concern of public health, it is of urgent demand for developing highly sensitive, selective, and low-cost Cu2+ sensors in environmental and biological areas. Unfortunately, conventional approaches for determination of Cu2+ ions including inductively coupled plasma mass spectrometry (ICP-MS), atomic absorption spectroscopy (AAS) and fluorescence spectroscopy, generally require cumbersome instruments, sophisticated operators and time-consuming sample preparation process. Organic electrochemical transistors (OECTs), as a new kind of organic thin-film transistor, shows high sensitivity since the device is the combination of a sensor and an amplifier, offering an interesting platform for constructing disposable, portable and real-time electrochemical sensors with high sensitivity. Attributed to the inherent advantages, like easy fabrication, good biocompatibility, low cost, flexibility, low operational voltage and stable performance in aqueous systems, OECT has shown promising applications in chemical and biological sensing including ions, dopamine, glucose, bacteria, DNA, and cell. Based on this observation, Lei Zheng, Hao Qu and Can Xiong reported the fabrication (Fig. 1a) and application (Fig. 1b) of PEDOT:PSS based OECT as an ultra-sensitive sensor for the real-time detection of Cu2+. The detection limit of the OECT device was as low as 100 nM (~ 6.5 ppb) of Cu2+, far below the requirement by the U.S. EPA limit. 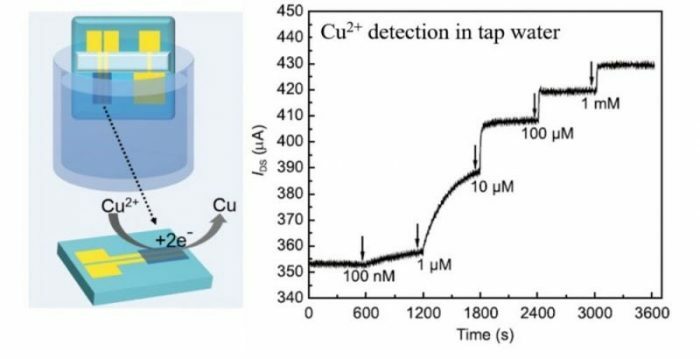 The ability for practical applications of the OECT device was also demonstrated for rapid and accurate determination of Cu2+ in tap water with high recovery rates (Fig. 3). The compelling performance of the PEDOT:PSS based OECT device enables it as a promising platform for simple, rapid and real-time monitoring of Cu2+ exposure for daily life, environment control, and public health. 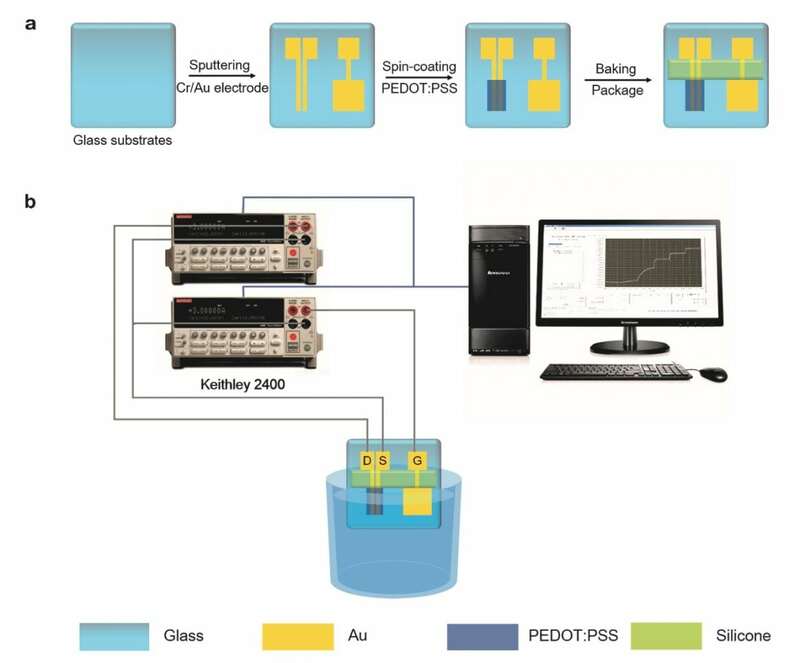 These findings are described in the article entitled Real-time detection of Cu(II) with PEDOT:PSS based organic electrochemical transistors, published in the journal Science China Chemistry. This work was led by Dr. Lei Zheng and Dr. Hao Qu and performed by Can Xiong from the Hefei University of Technology. Lei Zheng is a researcher at the Hefei University of Technology. Hao Qu is an associate professor and DNA researcher at the Hefei University of Technology · School of Biological and Medical Engineering. Can Xiong is nanomaterials and electrochemical analysis researcher at the Hefei University of Technology · School of Food Science and Engineering.